The idea came to my mind for the first time a few years ago. Although not difficult to realise it took me some courage to make it happen, but then… I decided to do it and soon enough I was getting in touch with Oli, Marco, Ema, Ian, Silvio, Gianmarco as I wanted to know if they where “in” for some work together! 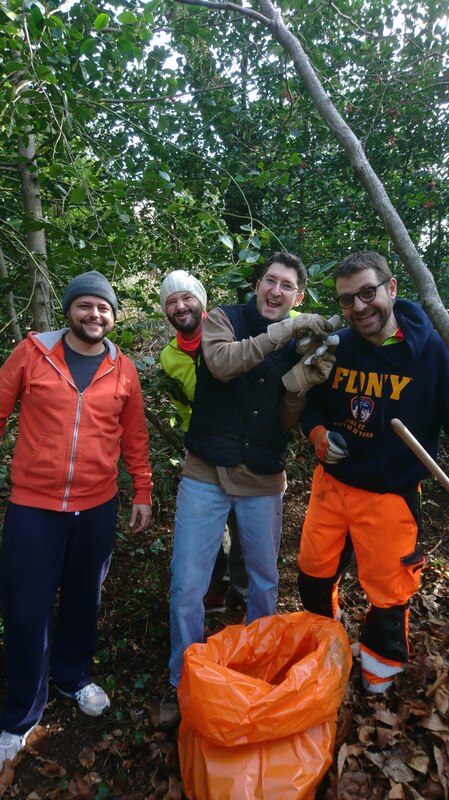 This time, the invite was somewhat different from the standard lunch invitation: although the aim of the event was to spend some time together I asked my friends to take working gloves and a rack as the plan was to clean the near woodland by removing some of the leaves that had fallen during fall. And this we did! 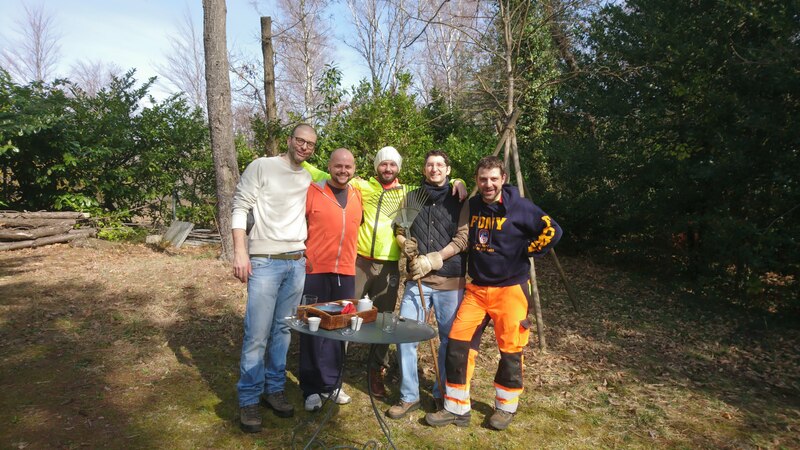 On the 09th of March at 09:00 o’clock Marco was at my door with all the tools, gloves, huge orange plastic bags and with professional gardening clothes ready to start La Grande Rastrellata! Soon the rest of the group showed up and the rhythmic sound of the racks hitting the ground made good company to the birds announcing the first days of spring. Everyone besides Giammarco, who had an accident the day before and could not stand properly. 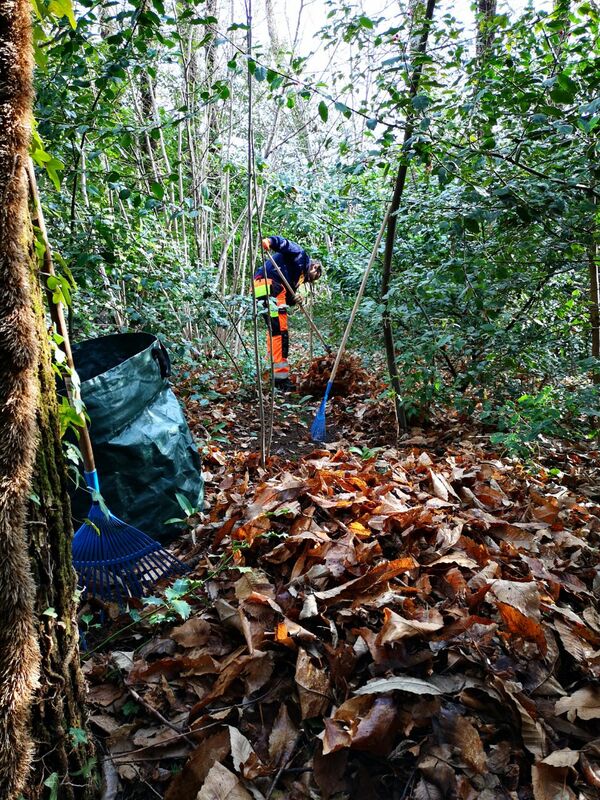 We decided that it would be best to start from the most deep part of the woodland and then slowly come back to the entry point while the we removed the leaves. Even if all of us try to do some sport during the week, after 01:30 hours we were ready for a coffee break. 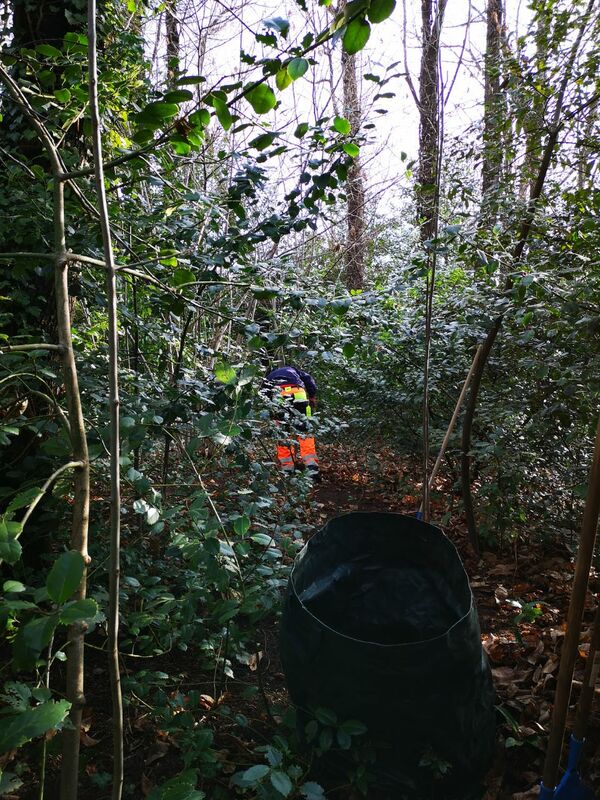 The first signs of fatigue were there, but in general ,the happiness of being outdoor doing a physical job was prevailing. After the short break we started working again. I even involved my father, who luckily was there, by asking him to prepare the grill and start grilling. 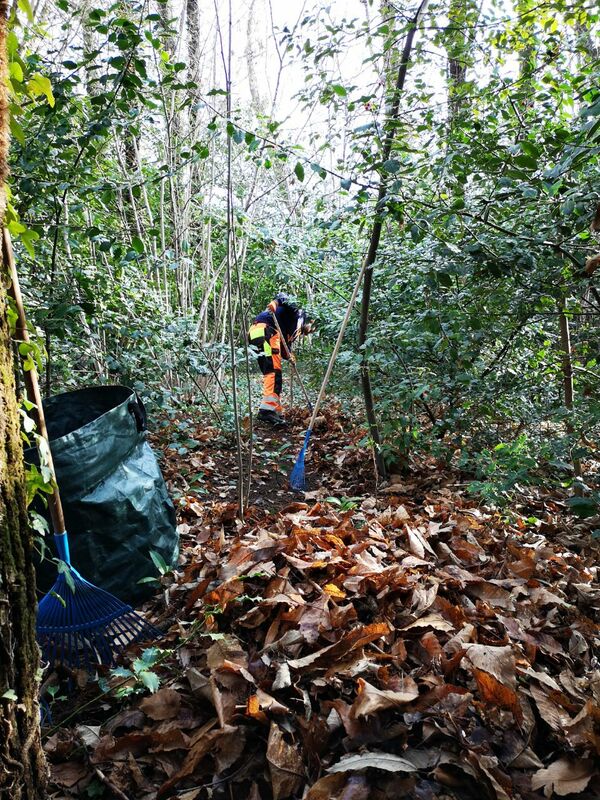 I knew that everyone was concentrated in getting its own piece of woodland cleared, but I also was aware that as soon as everyone would have finished, they would discover of being hungry as wolves. Around 13:00 we decided to stop. 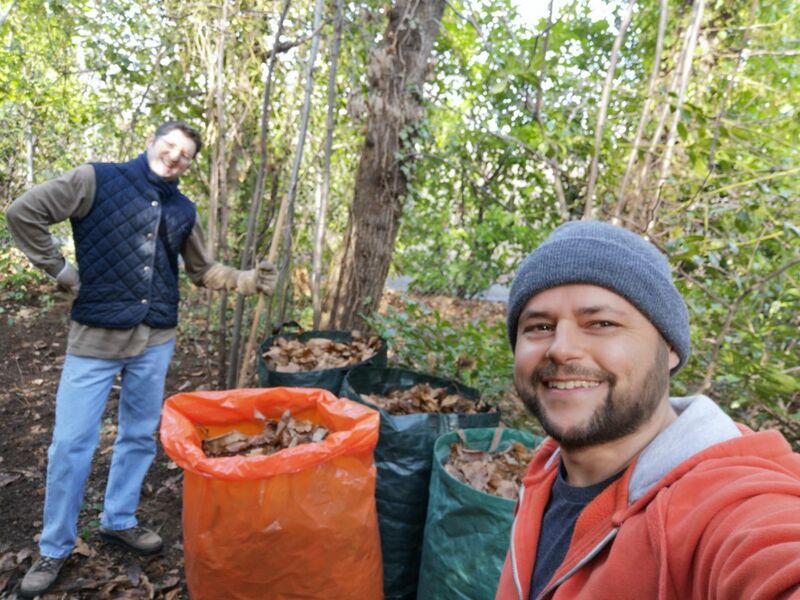 There still were a lot of leaves on the ground, but we already had filled all the bags we had. 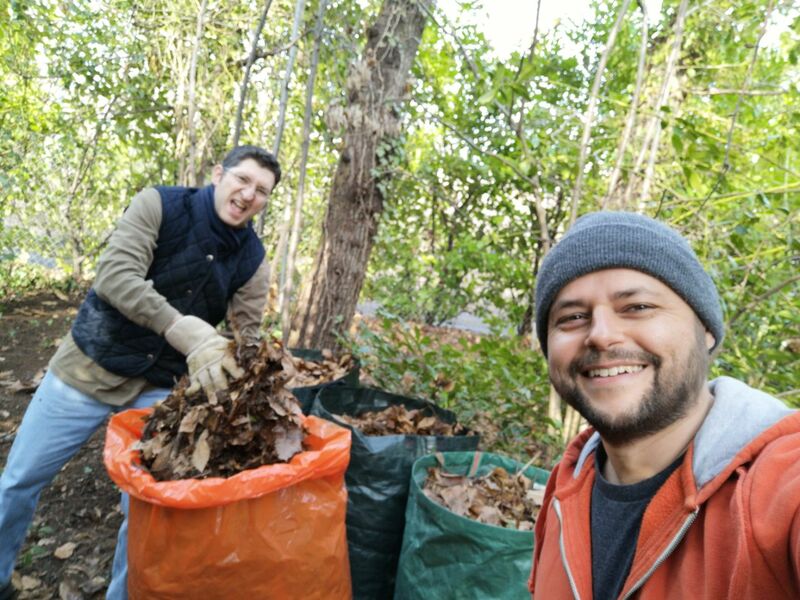 This also considering that Renzo had already taken and emptied some of the bags at the ecocenter. Since we did not have any empty bag to use, we joined the rest of the family for lunch: we started with some grilled bread covered with tomato, oil and oregano (bruschette) which was amazing. 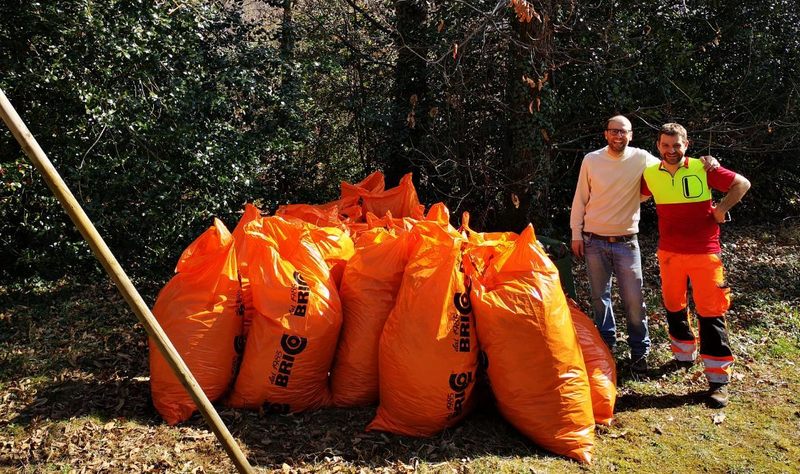 Some of the bags we filled with leaves. Even with that small hiccup we were all happy about the day. A good change from the daily office routine. 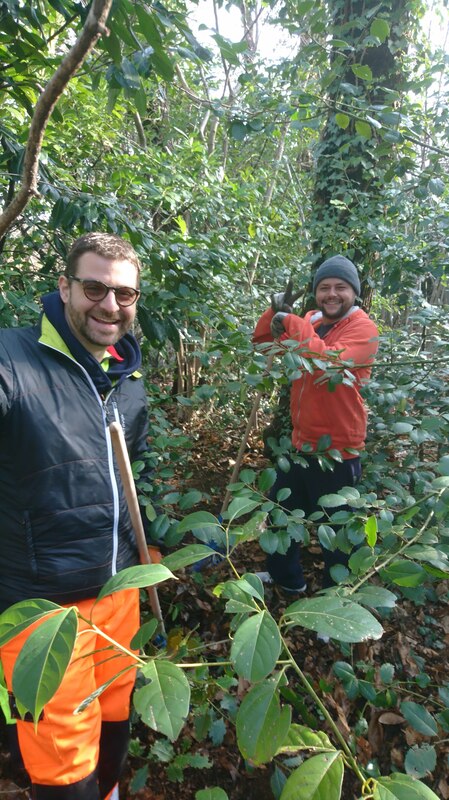 It is incredible how such an easy job as collecting leaves can have such a great impact on your mood. Of course with a group of good friends everything makes more fun! I have been waiting some news from my usual retailer regarding the cost of repairing the differential. During the second half of January I finally received the “official” answer: the price of the differential is of about 5’000 CHF. To the already high cost of the mechanical part I should add the work needed to make the repair: the total amount goes up to 6’300 CHF. In the meantime the noise did not change. Sometimes, mostly when I leave the car rolling, it changes tonality and seems to be louder. Funny enough, if I drive faster than 100 Km/h, maybe around 130 Km/h, the noise fades almost completely. Given the high cost of the repair I thought it would be a good idea to have the Swiss Touring Club (TCS) double check if the noise was really coming from the differential. Past Saturday I took the car to their workshop and after some routine checks we put the car on the auto lift: I stayed in the car and once it was high enough for the mechanic to stand below it, I started accelerating as agreed with him. It was quite strange to be “in the air” giving gas and changing gears. Around 100 Km/h the noise is the loudest and once I reached that speed I told the mechanic to start listening: he went below the car and with help of the stethoscope he was able to recognise the noise and to define that the noise was coming from the right end of the differential. It was really helpful having a neutral point of view. And of course, although I would have preferred that the answer was something different, possibly less expensive, I am now happy to have the source of the noise confirmed. The whole operation, being member of the TCS, cost me 50 CHF. Every mechanic I speak to tells me that it is very unusual for a differential to brake down. This led me to play with the thought, that maybe it was just a dose of bad luck and that actually, although an expensive repair I might have luck for the next years to come. Spending 6’300 CHF is still way less than 40’000 CHF for a new car. And as the car itself is still looking absolutely good I am kind of recalcitrant to change it. Also, as I use the car to go to work, reaching almost 35’000 Km per year, I do not want to invest in a new one. Ideally today’s car would be awesome. But… a few days later, I got proof that my thinking was too optimistic: the emission control light turned on. Of course this happened the day before leaving for a business trip of about 4 hours drive. I decided to swap car and use one which the company has at disposal for such events. This is the symbol of the emission control. Once back from the trip I took the car to the mechanic: in 30 min time he was able to tell me that the issue is most probably related to a fan not working properly in the exhaust vent. Nothing to worry about. Still, in case it would turn on again I should consider changing the exhaust vent, with and estimated cost of about 1’300 CHF. I drove to work hoping not to see the light anymore. But there it was! In the evening, as I started the car to drive back home the yellow warning light was staring at me, with a rather static expression! Oh well… between the noise in the back and the yellow light in the front, for sure I was not feeling alone! I have been waiting for it for almost the whole winter and finally, after being long anticipated, the snow arrived. And in large quantities, too! That day and that night were beautiful. I took the chance to have a little walk and take some pictures. Please have a look at the gallery below. If you click on the images you can have them bigger and read some descriptions I have added. Fortunately the snow stopped later at night: that way we all had our moment of happiness without getting into troubles. I had to invest some hours to move the snow from our parking lot and I was really happy of having two snow shovels ready to use. In my opinion it makes sense to remove the snow even if it has not stopped yet from snowing: this because if you remove a little every now and then it is easier on your body. Also if you move the snow immediately it is much easier to remove as it is not iced yet. A beautiful snapshot of Lugano early in the morning! When I took the picture I could feel the winter, the cold and sleepiness of the city in front of me. At the same time I was urged to take the picture as I recognised that the light was changing very, very fast getting brighter and loosing some of its magic. I wish to all of my followers, readers, occasional reader a happy new year! Noise detective: one more episode! I have noticed that I get somehow “attracted” by noises that might be indicators of something not working properly. For example, I already bored all of my followers about the noises of our heating system. And trust me, the ones that I manage to write about are the ones that give me to think the most: there are many, many others noises that get me suspicious that I do not write about, yet intrigue me as I am sincerely worried about the fact that whatever the mechanism is, is not working as it should. In this “episode” the protagonist of the noise is Celestona, our family car. It is a 2014, all wheel drive, Skoda Octavia. The engine is a TDI, 2.0L, 150 PS. I use it for my daily commute and from April 2014 until today I have collected almost 175’000 km. Mostly motorway. I have bet with myself that by driving safe and carefully I could bring this car up to 500’000 km without suffering major break downs. The bet might seem crazy, to me though, it seems fairly possible as I am driving always on the motorway, trying to respect all the speed limits and saving as much fuel as possible. This brings be to drive like an 90 years old grandfather with speeds not exceeding 105 km/h… unless I am very late for work. 😀 The question is… will Celestona make it to 500’000 km? It is very difficult to describe it in writing. If someone already has experience with ballbearings slowly wearing out… that is the genre of noise. It could be also exemplified by the rolling of very deep profiled tires as in off road cars (e.g. jeeps). I can hear it coming from the back of the car, it starts already at 50 km/h and changes tonality while speeding up. But it does not get louder or unbearable, it just changes its “voice”. I have been hearing it since months now: as I had it classified as a ballbearing being worn out I did not feel the urge to go to the car dealer and have it repaired. The first test I did was to wait out. I started to notice the noise during the end of the summer and I decided that I should wait for the change of the summer tires into winter tires. This way I would understand if the culprit were the tires or something else. I did the change of the tires in November: the noise was/is still there. I kept my noisy companion for one more month until it was time for the 180’000 km service. This was my occasion to have the ballbearing changed! From an organisational point of view it was a great idea as I could take the car just once to the dealer and have the service as well as the noisy issue solved. As usual, the Volkswagen team is very efficient and in one day my car was serviced and the rear right bearing substituted. Fantastic. I was less enthusiastic when driving home I noticed that the noise was still there. It was quite a big disappointment realising that the car had not been tested after being repaired: in my naive mind it should go without asking that repairs should be checked once executed. But then… where is the noise coming from? Having changed the posterior right ballbearing, my suspects were on the left one: I asked to Volkswagen mechanics to double check that. I took the car once more to the dealer and during the afternoon Marco, my reference person in Volkswagen, called and informed me that in their opinion it was not the posterior left ballbearing the culprit: the differential was it instead! Changing a differential is very, very expensive. When I got the news I was definitely sub enthusiastic. Marco confirmed my fears by anticipating me, that the differential by itself would cost 5’000 CHF. To that I should add the cost of the work for changing it. I quickly did a research of the on www.autoscout.ch to have at least a feeling of which is the market of value of my car on the Swiss market. Around 12’000 CHF. Given the market value and the cost to change the differential the “new car scenario” started to show up. Not only that, but also the “I have lost my 500’000 km bet” scenario showed up… It is a personal challenge, so nothing serious. But somehow I was disappointed! Not the last word… yet! After a few hours of overthinking the matter I took the decision to have a second opinion of another mechanic. I took the car a Skoda dealer very near my work place, together with the mechanic we took her for a quick spin and guess what? In his opinion the possible culprits are two: either the tires or the ballbearings. Considered that the tires have already been changed once and that the noise stayed there, we have a second opinion indicating the posterior left ballbearing. Very important is the fact that the mechanic defined a faulty differential as not an option as it would sound in a very different way, if it was damaged in any way. Another thing that reassured me was the fact that the differential is not in use at all when the car is driven at motorway speeds. Basically it gets activated only if the front wheels slip. If they do not slip it does not get even connected. In conclusion we decided that I should keep the car as it is. The noise should worsen and make it easier to understand whether the source is the posterior left ballbearing or something else! There is one thing that keeps my mind grinding: why has my usual Skoda dealer, Marco, told me that the differential should be changed? What was the issue they noticed? Should anyone have suggestions regarding the matter… please let me know! To arrive there it takes almost one hour starting from Celerina. The road is entertaining as there many turns, some of them changing their range and getting tighter as you drive through, while the best ones happen on some really old, narrow, bridges… (EvilGrin). Of course it is a lot of fun if you are driving with someone who is enjoying the sporty ride, on the contrary, if you are travelling with the whole family the drive takes some concentration as you try to make it as comfortable as it can be by avoiding sudden accelerations and decelerations. The first time I reached Ftan it was an evening in winter, it was snowing quite strongly and as a consequence the road was completely white. Very soft to drive on. Per se a beautiful view. The car I was driving, a Skoda Octavia, was new and being a four wheel drive I was feeling safe. Soon we started to encounter some cars which could not proceed, drivers and passengers trying to move them out of the way, while on some others cars people were installing snow chains: this was happening on the main road, imagine on the smaller ones! I remember that on one hand I was surprised, as they were local and for sure well equipped with winter tires, on the other I was happy of not having to worry as my new car had four wheel drive… right?! It was almost at the end of the trip, when the slope of the road started to increase, that I had to recognise that something was not working as it should have: the car was struggling to keep pace, it was loosing grip. But… how come? The Skoda Octavia 4×4 is well known for its performances on snowy terrain… And my situation was not that extreme! In the end, we almost reached our friends house, the very last piece of road was way too steep for my car to overcome. As you could imagine “the defeat of the Octavia” was the topic for the whole night (and in my mind, for many days later). Around midnight we took Arno’s Subaru Outback and challenged it with the same road… “the defeat of the Octavia” got even bigger and painful as the Subaru had not one second of hesitation, even in the worst conditions. To make the story short, once back in Lugano, I took the car to the mechanic, which discovered the issue, and the car was repaired under warranty. Even so, it was a big disappointment for me. Really strange was also the fact that the car did not give me any kind of message or alarm about the malfunction. After the repairs I did not have any chance test the car again: I have been in snowy situations a few more times, but not as snowy as that time. This is also why I am seriously considering a front wheel drive car for the future… but let this be a topic for a future post. …we arrived safely at Arno and Giusy’s place right in time for lunch. It was really nice to sit all together, having something simple to eat and chatting a little about everything, be it about work, fitness, future plans, kids… 🙂 Arno and Giusy are some years older than us, therefore they do have some more experience to share about kids (and of course about many other topics too). In the afternoon we also had the chance to have a walk through the village: we would have loved to make a bigger tour, but it was starting to rain, therefore we had to keep it short. Giusy & Tango leaving for the short walk. Tango was waiting for that moment for a long while and was more than happy of being on the outside again! 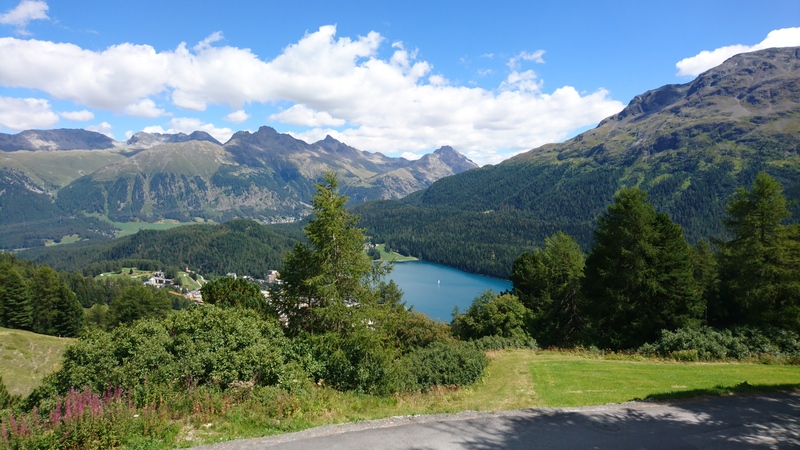 How is Ftan different from St. Moritz? The atmosphere that you get to breathe in Ftan is really different from the one you get in St. Moritz or in Celerina. It is much more relaxed and familiar, probably because Ftan is smaller and, geographically speaking, not as fortunate. Ftan and Scuol are in a valley which is tight, like a V, whereas St. Mortiz and Celerina are in a nice plain, the lake giving much more room and light. On the contrary once you are in Ftan, if you watch in front of you, you have a wall made by mountains. Which are beautiful, but still… On some occasions a little oppressive. 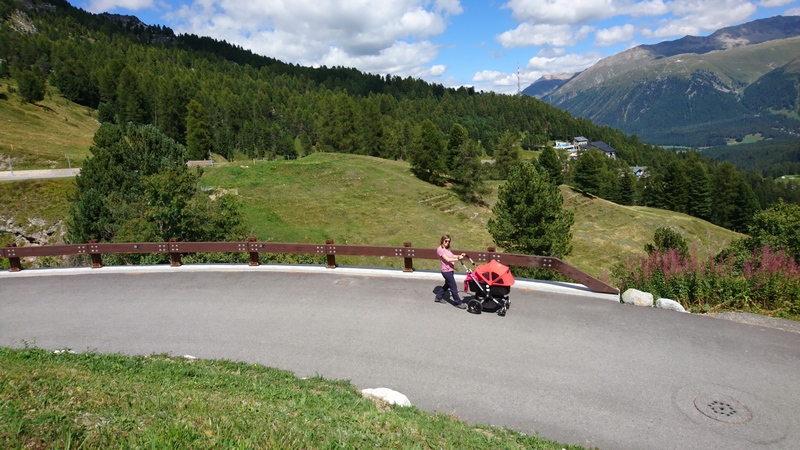 Still Ftan might be preferred as St. Moritz is way too crowded for someone who is looking for some peace and nature. 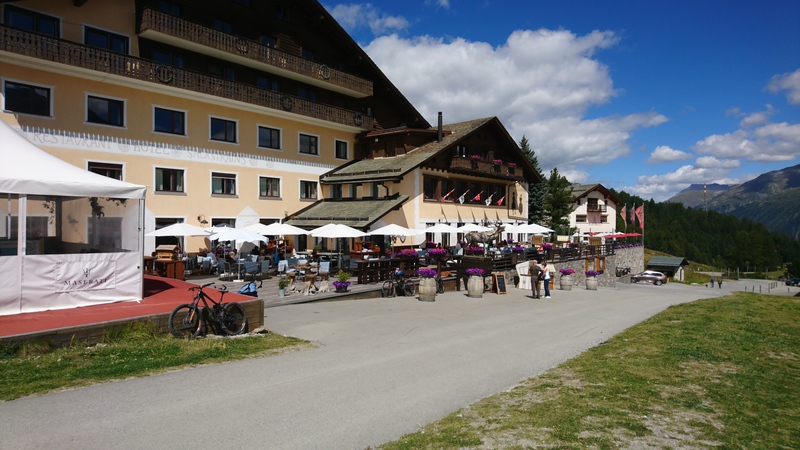 Furthermore the tourism has completely changed the people and the society living in St. Moritz. In Ftan this is not the case and even though the tourism is for sure important, the people are much more authentic and down to earth. Walking our way back I took a picture of Ftan. Incredibly green as most Swiss mountain villages. Note the school on the left (yellow building), on the back, cutting the forest, the ski lift. 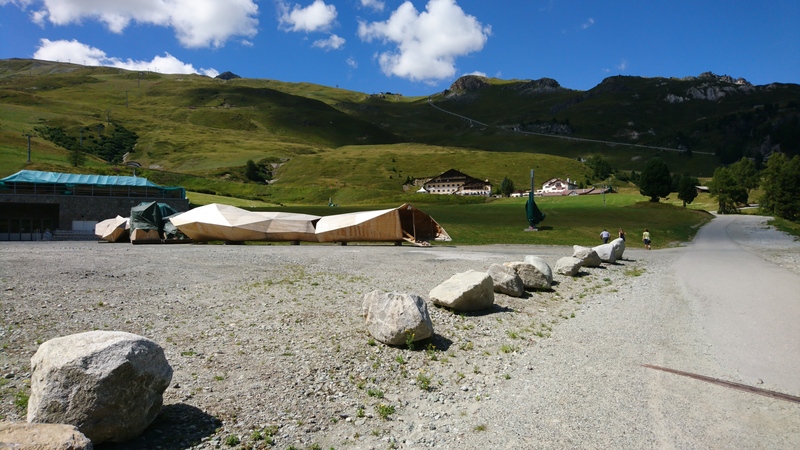 During our chats with Arno and Giusy we discovered that Ftan also has a new school: “Das hochalpine Institut Ftan” where boys and girls can learn and get their high school diploma while practicing a lot of sport and enjoying the beautiful area. I do not know if I would send my son there though, I believe it is way too much cut off from the rest of the world (although very much depends on the kid, if he/she is not interested or curious of the world around him, even if you take him in a very cosmopolitan city, he might not absorb that much). Which brings me to think about one question which I have made myself multiple times already, i.e. 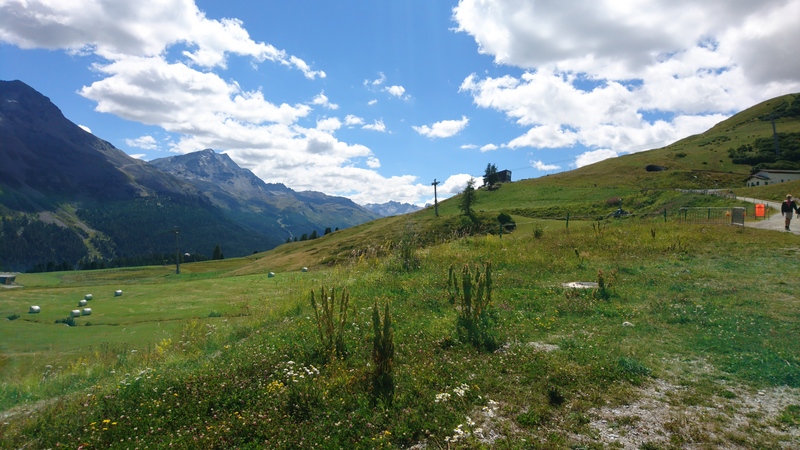 about living in Engadin or in a place in the mountains. I am not too sure if I could stay in such a village for a longer period of time… generally speaking, the loneliness is something that appeals me, but for how long? We did not know about it. 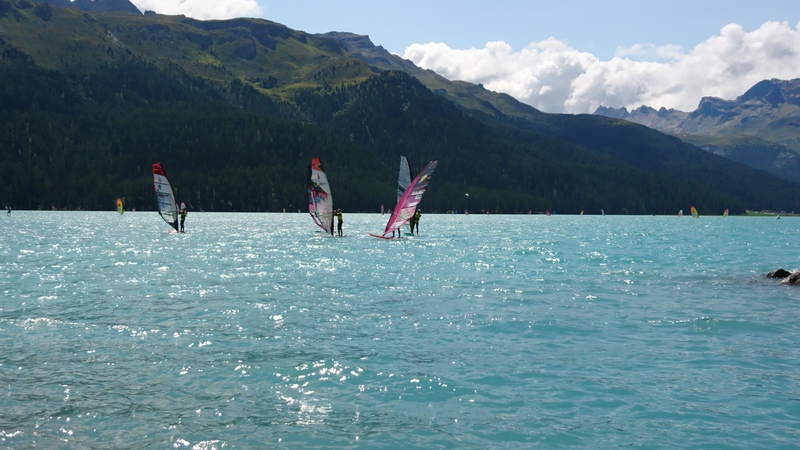 I remembered from the past that Silvaplana was one hot spot for windsurfing, but we had no idea that during those days there would be the Swiss Championship. 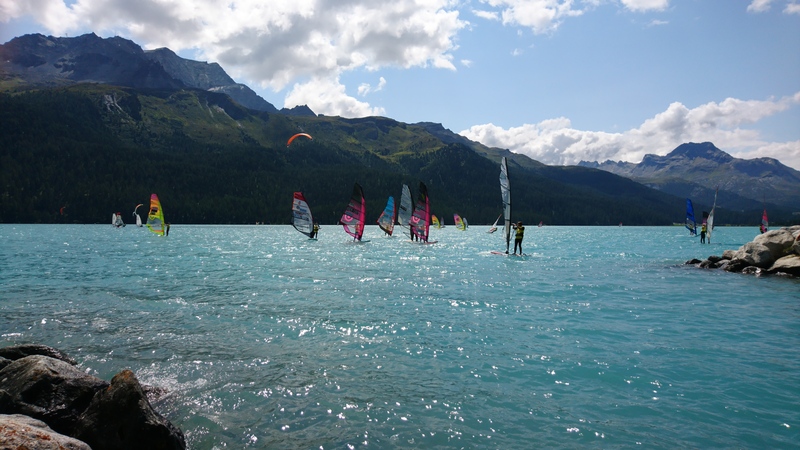 That day we did not have anything planned, we were ready to leave for St. Moritz and have a classic tour of the lake when I suggested to drive some more and reach for Silvaplana, where often there are kites and windsurfers which are always entertaining to look at. So we went there… and… we fell right in the middle of the racing! What for an atmosphere! First of all: there was wind! Cold and powerful wind capable of new and creative haircuts and of making you wink your eyes. Plentiful of flags, bending and slamming each one with a slightly different rhythm as if they were to keep the pace of the event. Funny picture of Natascia checking on Jacopo while everything else is flying! The voice of the reporter, which continuously kept everyone up to date with the development of the regatta, people everywhere: some preparing for the race, others, already wet and tired changing and warming up, few reading the newspaper at the bar as if nothing was going on, even a couple with a red stroller was there! 😉 And of course… the sails! With all their beautiful colours, flying from left to right and back, mixing with each other, there they are, the windsurf sails. Very near to the shore… and fast! If we have to… we wait! 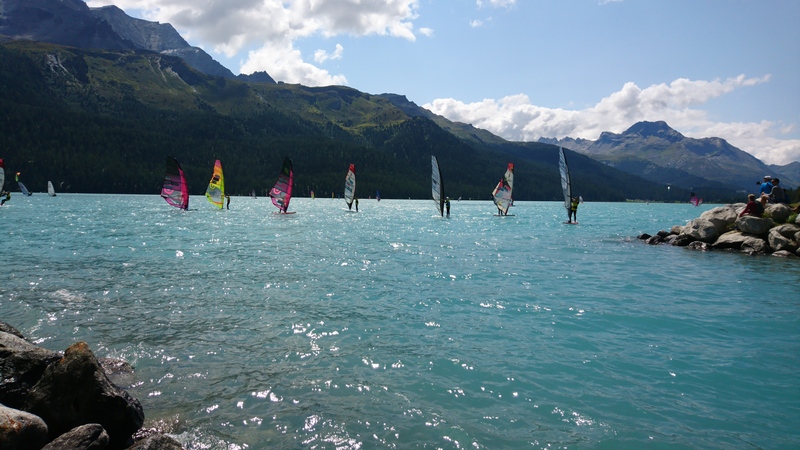 Windsurfers waiting their turn to compete. While they were standing and waiting for their turn to race I could easily shoot some more pictures. For those that like videos better… Enjoy the start of the regatta! I have also found some professional pictures taken from the official photographs during the event. If you like have a look here. We had a very tasty hamburger at the restaurant of the windsurfing club after which we prepared ourselves to go back and finished our day on the lake of St. Moritz, which was also well beaten by the wind. 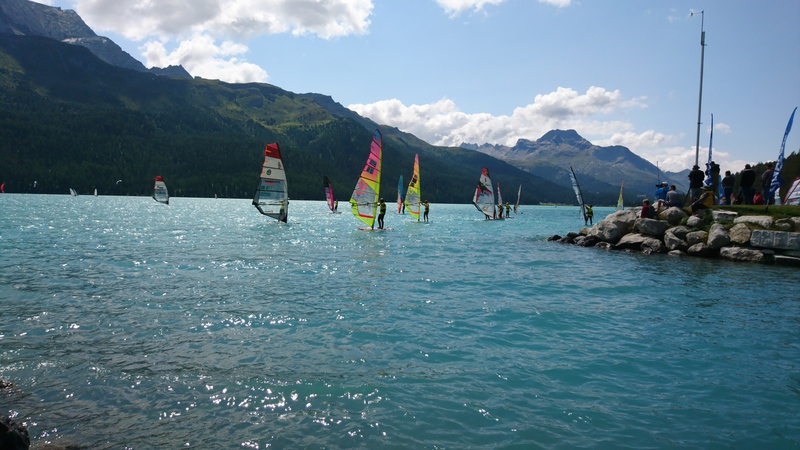 Even if it is a small lake some sailing boats were definitely having fun! While walking around the lake I kept looking at the boats that were tacking across the lake and could not stop myself by taking some pictures! Definitely a great day for those loving the sailing sports… and also for us that were just walking and looking, it was entertaining and energizing! Jacopo conquering his first ‘peak’! To say so it is just a little exaggerated, but it was indeed the first time that the three of us reached a restaurant on the mountains! Getting there was very easy, no need to climb anything… Someone else did this for us in the past and now we may use a marvellous, small, blue train. This is the marvellous blu train that took us to Chantarella! 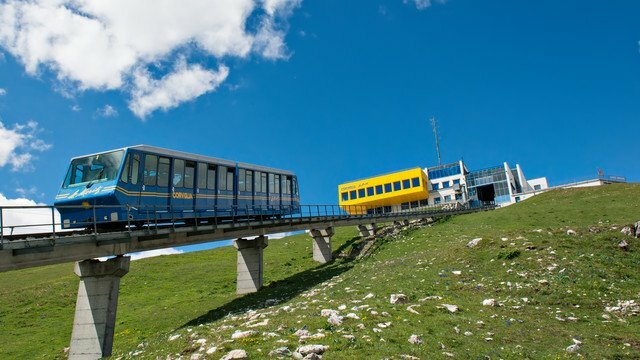 Let’s be honest though: the train is not marvellous per se, it is just the fact that it allows you to go up the mountain with the stroller without sweating a drop, that makes it interesting! Oh, and as Natascia pointed out, the station is not stroller friendly, meaning there are only stairs… Stroller needs to be lifted, daddies be prepared! This was the view we were gifted a few moments after the little train left the station. I believe that one of the great advantages of this train is that it starts directly from the city. The first stop of the train was ours, so we “jumped off”, carried the strolled until the exit and started our walk towards the restaurant, which was really near (around 10 min). The place was very nice, but probably not our genre: believing that there was no other choice we blindly reserved a table without looking further. We did not feel comfortable since the atmosphere, the service and the food offering were slightly posh: at the same time though you could understand that they were struggling with the organisation of the work, plans had to be changed, customers requests went lost or were wrong… The manager, was giving instructions to his subordinates on the fly and with loud voice while running from to the tables to the kitchen. I believe this is more adequate for a pizzeria than for a restaurant. My smile got even bitter when the manager claimed, talking with the guests sitting behind us, to have been working in the very same restaurant for the last 35 years. Next time we should double check if there are other options available which fit better our way of living the mountain. For sure a picnic could be a great idea, more so, since there are dedicated areas which have beautiful wooden tables and sometimes even grilling facilities. A few steps away from the restaurant we saw this play area where you could easily have your lunch. You just need to organise yourself a little earlier… and in case you should have kids they will love the possibility of playing! While “walking down the street” to get back home I stopped a few times to take some more shots. Natascia and the red bugaboo walking down the street. I decided to take the picture because of the view, the light, colors… but as well as because of the of the pylon that gives depth to the picture. Beside the view I also found something that caught my curiosity. I still do not know what they are, so please do not ask, and the picture I took, I took only because I liked the geometrical shapes. Are you curious too? Let’s have a look! 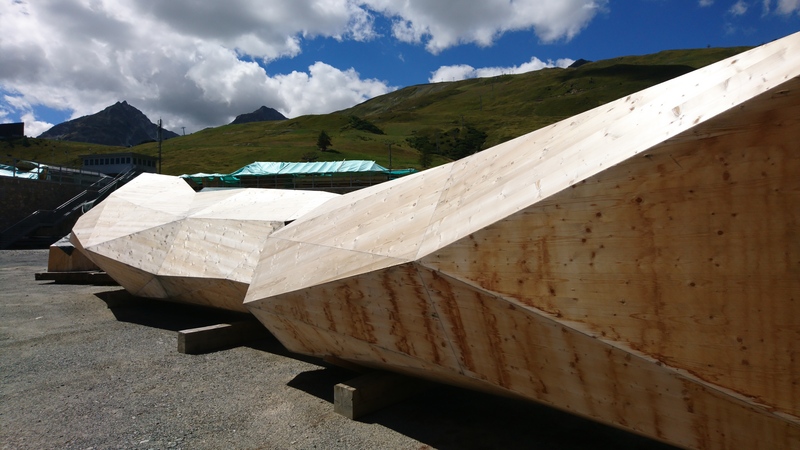 Some wooden construction which is currently “parked”. What could its use be? 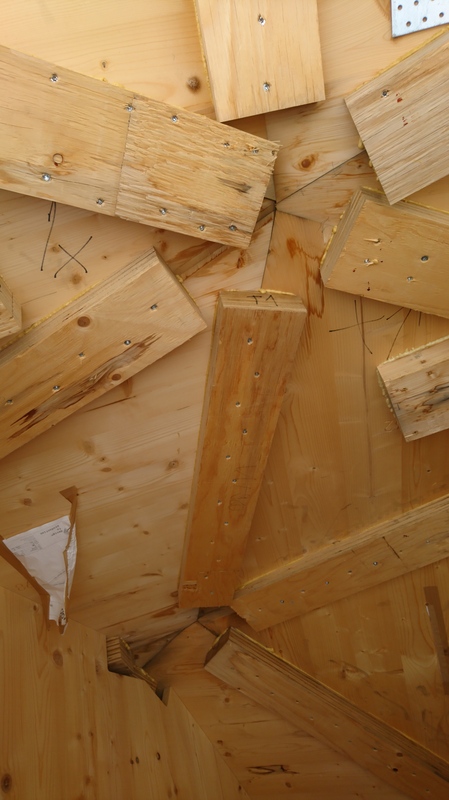 … the wooden building and the notes that were left during the building. Seemed a quite complex build! 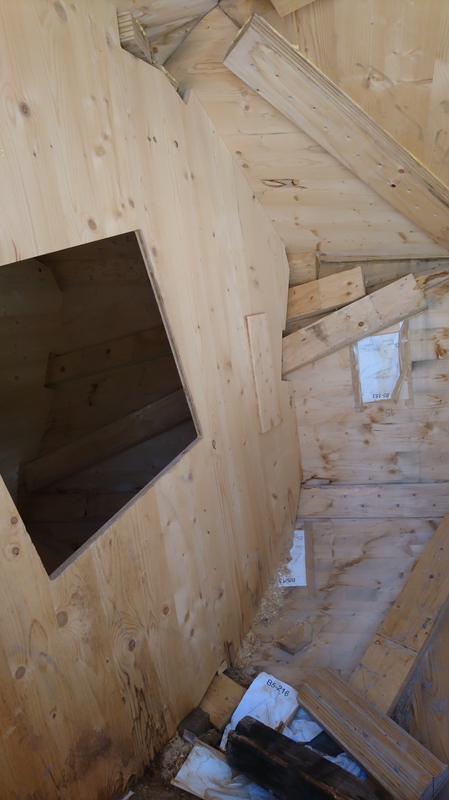 A little detail of the internal structure. Leaving the wooden sculptures behind and keeping the questions regarding their use or destination, we continued our walk without further breaks until the city where we had left our car. Once home we chilled down a little, while some, slept some more. It was then time for a quick drink in Celerina, followed by dinner… and suddenly it was time to put Jacopo to sleep again! We started the holidays by working on our luggage and Jacopo’s as well! 😊 I could not believe my eyes when I realised that all the things we had accumulated could fit in our car without even sacrificing the passengers seats. I am really satisfied with the capacity of the trunk of our Octavia (although the water pump recently abandoned me, leaving me on the motorway with a overheated engine)! The trunk is almost completely full! I managed to fit even two chairs that I have had fixed in the past months. In any case back visibility was seriously compromised, better use the side mirrors! In our plan we had one more appointment to attend to: we agreed to meet Marco, Maite and Peio for the first time since one year! We did not meet them since the last holiday in Schinoussa which happened exactly one year ago. Since then three major event changed our lives: the birth of Peio followed by Jacopo’s and last but not least my hair cut (which now is really short!). When we arrived in Dino we were overwhelmed by the amount of kids that were there, as almost the whole family of Marco was there. Could you imagine?! The living room where I and Marco have been learning for hours during high school first and university later was now filled with kids and babys… Out of which, two were our children! 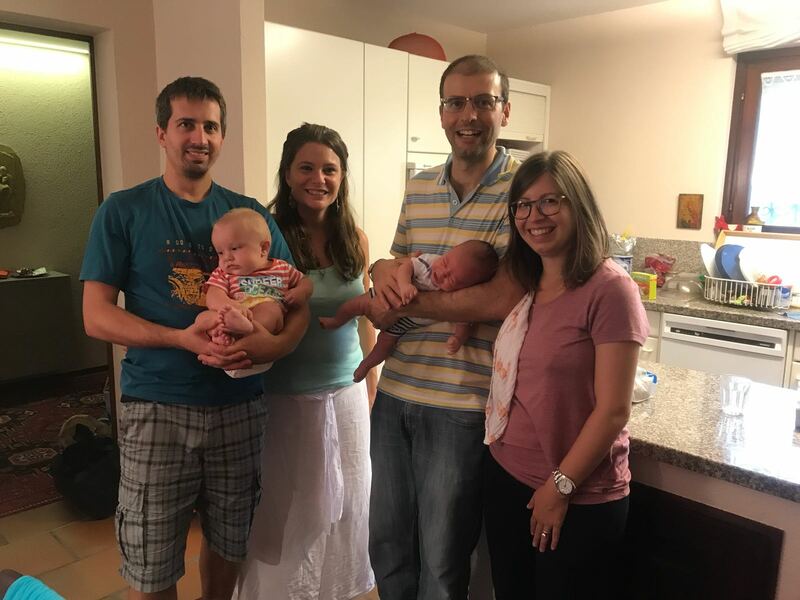 The two new families together… What a big change, after only one year! After some chatting with Marco and Maite, we left Dino and began our trip to Celerina: Jacopo started complaining after one hour since we left, therefore Natascia decided to seat next to him in order to play together and to keep his pacifier in place: we were told that this would help him contrasting the difference in pressure due to the change of altitude. All in all I believe it took us around 2 hours and 45 minutes to arrive, which is 15 minutes more than usual, the trip went very well! Driving with a baby on board changes your style of driving, at least a little, as you are aware that in the back there is someone who is not capable of anticipating what is going to happen next, either because he does not see it, either because he does not have the strength. Therefore, driving on a mountain road, I had to refrain a little from giving full gas at the end of each turn… Which otherwise is great fun (more so with a diesel engine, having a lot of newtons to discharge on the road)! Diabolic grin! Slightly before arriving it was clear to everyone that Jacopo patience was at its limit, he needed to get out of the car, have a walk and a smoke… Err… As soon as we arrived he had his milk! But we were not organised for all of his needs, a lot was still in the luggage, meticulously packed in the trunk of the car! With some effort, tired from the driving and hungry (we did not eat much during lunch as we were packing), not only we unloaded the whole car, but I even managed to inflate the exercise ball. The exercise ball: what a failure. It needs a dedicated paragraph, if not a dedicated post. Since Jacopo was born we started to use the exercise ball as it was very effective to calm Jacopo’s colics attacks. We used to bounce on the ball while holding Jacopo in our arms: the rhythmic movement would help Jacopo to tranquilize and fall asleep. A very important tool for us… I would suggest it to every new parent. It has a big disadvantage though: once inflated it is not easy to fit in a car which is already quite full! Luckily enough I found a second ball, which was already deflated, thus much easier to transport… Yeah, wait, but why is the ball deflated? Maybe it is perforated? And how should I inflate it? I was so lucky that in the past I had already bought adapters for my bike pump, so I decided to test the pump and its adapters by inflating the ball! And it worked! The pump was a bit small therefore I had to keep a good rhythm in order to have some progress in a reasonable amount of time… But you know, being such an important tool for us, better to be sure that everything works! Since inflating the whole ball took me a lot of energy and sweat, while packing the car I tried not to deflate it totally as I did not want to reinflate it starting from the beginning: as long as I tried I could not manage to make it fit without deflating it almost totally. I packed also my old bike pump (a great gift that I received from my father when I was a boy) with all the adapters and… Hopp we go. Arrived in Celerina it was time to re – inflate the ball (second time during the same day) and… As soon as the ball regained its spherical shape, my precious pump broke. Ouch. This was not foreseen during my tests at home! Still, thankfully I managed to slowly inflate the ball until it reached a decent strength and size. Quite happy for my performance I decided to test the ball with Jacopo… And there you go… It is not enough bouncy. Jacopo does not even feel the movement! Snap! The exercise ball which is not bouncing enough to tranquilize Jacopo when he suffers from colics. Probably it was not what it was designed for! We were lucky that night Jacopo was quite tired and fell asleep almost immediately. We followed as quickly as possible! I have got this news this morning and thought I might share it, hopefully contributing to a more private and faster internet experience. But please, don’t be fooled, the increase in speed won’t be easily observable as we are talking about milliseconds. Yes. In the networking world when you test networks it is a common practice to send data packets to other computers on the network and measure how long the packet takes to come back. This test is done through the ping command. Of course the amount of time that these data packets require is very short and this is why it is measured in milliseconds. As I mentioned above, making this change is not something that will make observable differences to your daily internet experience, still by reading the official data on the homepage dedicated to this project, it seems like the amount of time required for a data packet “to go and come back” is reduced by half, by using the new DNS 1.1.1.1 instead of the widely used google DNS 8.8.8.8 or 4.4.4.4. From this data it appears that pinging google DNS 8.8.8.8 should take 34.7 ms, while pinging 1.1.1.1 should take 14.8 ms. This is what made me consider the fact of changing my current setting: for sure we are talking about milliseconds. Still it is half the time I would normally require to have an answer from Google’s DNS. Really? Let’s try it then! Pinging 1.1.1.1 gets an average of 14.877 ms.
Pinging 8.8.8.8 gets an average of 20.068 ms. But speed is not the only concern. It seems that DNS, as it is used today, can be used by ISPs to collect information about which pages are visited by whom. Even if the visited pages are securely encrypted and showing the green https:// in the address bar the ISP will still know that you are visiting that page. And, it seems like some ISPs could be tempted of selling this information to other companies for marketing reasons. As stated on the project homepage Cloudflare and APNIC have teamed up to change this and make sure that by using 1.1.1.1 no IPs will be logged, which will considerably help in respecting the privacy of their users. Should you be interest on more details regarding the subject you may want to read cloudflare’s blog. Personally I haven’t had any issues in making the change, also because my network configuration is pretty simple. I have already read that for some countries and with some ISP there are issues as the address 1.1.1.1 has been used for a wide range of scopes which may interfere. If I understood it right though, if you are able to open https://1.1.1.1 you should be fine. Mike on Holidays begin… Finally!